When I was Sydney last October, preparing for the IUCN World Parks Congress with the French marine protected areas agency, this headline above was splashed in similar formats across several Australian newspapers. a 4.5m shark (if that was even the correct size) is not a monster in size. 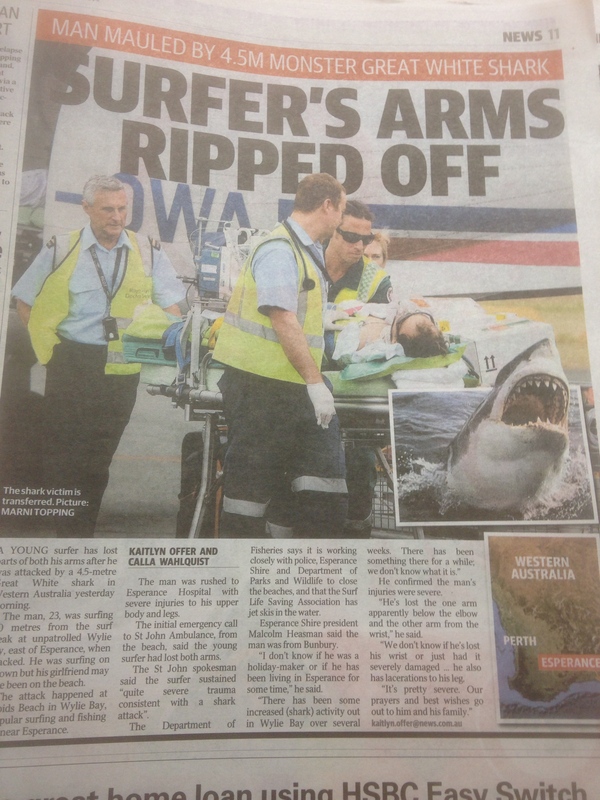 If it had been a validated sighting of a 6m white shark, I would have been more impressed. My most popular article from this irregularly-updated blog is another shark attack post that made exactly the same criticisms I can make two years later. I image the people googling that phrase came across the post, saw it was attaching the whole tabloid concept of ‘shark attacks’ and left to find juicy photos of actual shark encounters. Because that’s what these incidents are: encounters. The increased populations around coastal areas in the warmer months, coupled with overfishing of shark prey species, surfers spending longer in the ocean due to thicker and more comfortable wetsuits, climate change and other unpredictable factors, is leading to more encounters with sharks. And if one in 1000 of those encounters ends in a shark bite, we shouldn’t be surprised every time and call for that shark’s head. This only supports the view of shark fishers that they are removing dangerous animals from the ocean, rather than murdering an endangered animal (in the case of some shark species). So far in 2011, there have been at least 61 recorded attacks and 10 deaths. However, compared to deaths from smoking, road accidents, lightning strikes or even other animal attacks, the risk is minute, say experts. So please can we stop with the tabloid shark bashing, stick to the boring but correct title of shark encounters and help target the real villains in this debate: fishing trawlers that are destroying the shark-prey food chain and governments who keep approving shark hunting after each encounter in the misguided view that killing that one ‘manhunter’ shark will end the chance of any further shark bites.